If you know these back stories, you're clued in and can embrace this production fully. If you don't, it plays more as a Telamundo soap than a Shakespeare classic. Either way, the lovers at the center are a joy to watch. Romeo and Juliet is a timeless play. Laird Williamson, though, sets his Romeo and Juliet in the specific time and place of California 1847–1849. From the time Mexico ceded the territory to the United States to the gold rush and statehood, California's rancho vaqueros lived like landed gentry in multicultural communities under U.S. military occupation. While this time and place may serve several aspects of Shakespeare's play, Williamson seems more intent on telling the Californios' story than Romeo's story and that of his Juliet. 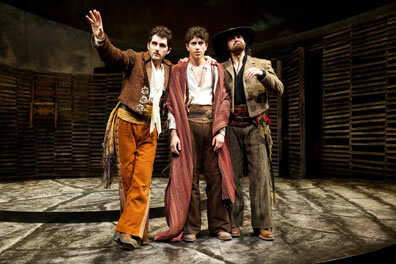 From left, Benvolio (Kevin Fugaro), Romeo (Daniel José Molina) and Mercutio (Jason Rojas) decide to crash the Capulet party in the Oregoen Shakespeare Festival production of Romeo and Juliet set in California circa 1847. Photo by Jenny Graham, Oregon Shakespeare Festival. The hacienda setting establishes the rivalry between the Italian-descendent Montagues and the Spanish-descendent Capulets, their feud perhaps descended from the range wars between sheepherders and cowboys. Prince Escalus is a U.S. Army general, Paris an Army captain, and the apothecary is an Ohlone medicine woman (not a Shakespearean misstep, but while Ohlone shamans were said to be able to bring about an individual's death, the possibility of a healer carrying with her a lethal potion or to be in such need of cash that she would sell it to a vaquero is a stretch). The fights are fervently fought with swords and bullwhips; Juliet gets to snap at the nurse in Spanish during the balcony scene, and Williamson gets to play up to the hilt the text's bawdiness. Nevertheless, the biggest plus that comes out of this setting is the set itself. Michael Ganio designed curving stonewalls with wood-ribbed backings that serve as the town square, the villa's interiors, and, by rotating them, the Capulet's vault, while a back screen presents day and night. Susan Tsu's costumes are historically accurate, the men wearing lavishly decorated vaquero duds, but their colors muted from dust, constant wear, and the occasional river-rock cleaning. As for Shakespeare's Romeo and Juliet, this production offers more in the way of potential than present insight. The program notes point out that with his Chorus, Shakespeare tells us at the start how the story will end; the drama is in watching the tragedy's inevitability unfold and getting caught up in the humor and passions of the characters. Williamson hitches onto the recent trend of having the whole company speak the Chorus in turns, but the most prominent speaker is an old, blind black woman. At play's end, this woman returns to speak the play's ending couplet, and now we know it is Nurse (Isabell Monk O'Connor). There's a clue for future directors: Give the Chorus to Nurse and let's watch the play through her perspective. Or give the Chorus to Friar Laurence; as with Nurse, his decisions throughout the play prove to be the bumpers that constantly redirect the lovers' course to tragedy. A subtle measure of Romeo and Juliet's effectiveness is how thoroughly you are swept along in the rush to tragedy without noticing the holes in Shakespeare's plot. Those holes seem particularly gaping in this production in large part because Friar Laurence (Tony DeBruno) seems so slow-witted he is incapable of realizing how telling the truth at any point would avert ultimate tragedy, especially as Don Capulet (Elijah Alexander) seems so calculating and politically conscious that, once Romeo and Juliet are married, he would have preferred learning the truth than ramrodding a marriage to Capt. Paris (Miles Fletcher) down Juliet's throat. Nurse has such an easy rapport with Juliet she could easily have waylaid the lovers early on, too. However, their roles in this production are tied more closely to the historical setting than Shakespeare's tale of star-crossed lovers. In 1847 California, the missionaries (Friar Laurence) had been dispossessed and were on precarious footing, people of color (Nurse) subsisted at the mercy of their landed employers, and the proud vaqueros (the Capulets) were trying to hold onto their land and power under an occupying force (Escalus, er, General Prince). And even though Don Capulet is, from the start, eager to marry his daughter to Capt. Paris, Doña Capulet (Vilma Silva) resists the match; why is not clear as, in addition to all the historical back stories, the Capulets have some sort of personal history teeming under the surface of their relationship. If you know these back stories, you're clued in and can embrace this production fully. If you don't, it plays more as a Telamundo soap than a Shakespeare classic. Romeo (Daniel JosÃ© Molina) and Juliet (Alejandra Escalante). Photo by Jenny Graham, Oregon Shakespeare Festival. Either way, the lovers at the center are a joy to watch. Daniel José Molina plays Romeo with a natural charm, given to joviality (even when in despair over Rosalind). His predisposition to peace and happiness takes a traumatic blow when Mercutio is killed under his arm. "I thought all for the best," he says to his dying friend, and his reasoning doesn't even hold weight with his own self. He reverts to another natural disposition of his upbringing by focusing all blame on Tybalt, and upon killing Juliet's cousin, Romeo sinks into true remorse that haunts him to the play's end. Alejandra Escalante plays Juliet as a girl guarded by her parents from the real world of frontier living and territorial politics. This naiveté gives her a sweetness encased in a family sense of pride, and that pride takes on a hitherto unseen fierceness in the wake of Tybalt's death as first she castigates Romeo and then, after Nurse joins in her condemnation, she shifts abruptly to a stout defense of her husband and, more importantly, her marriage. It is the sanctity of that marriage that gives her resolve in the last quarter of the play, from standing up to her father when he insists she marry Paris, through agreeing to participate in the friar's scheme, to her unequivocal—and quick—decision to kill herself upon discovering Romeo dead. Romeo's and Juliet's scenes together are the production's highlights. Their meeting is heart-fluttering romantic as their dialogue forms a single sonnet. The balcony scene is bumbling courtship by two youngsters unfamiliar with heart-consuming love. Their parting is made the more bittersweet by seeing them, post-coitus, comfortably married. Williamson gives us an additional scene, too; upon the Capulets formally carrying the supposedly dead Juliet out of her bedroom, she slips away, prances over to Romeo revealed to be sleeping on the opposite side of the stage, kisses him, and glides off. He awakes and describes this dream (in Shakespeare's text), and our own delight at having witnessed his dream gets dashed when Balthazar arrives with the news of Juliet's death, news we know is incorrect. The emotional juxtaposition of what could be and what we know will be is this production's most effective moment. Williamson makes another interpolation in Shakespeare's text by bringing Mercutio into the action well before Shakespeare does; thanks to Jason Rojas' performance as Mercutio, that's an entirely forgivable intrusion. In this production, Mercutio spies on the Benvolio-Romeo conversation in Act I, Scene 1, and he joins them for the next scene, too, taking over some of Benvolio's lines and reading Peter's list of invitees to Capulet's party. He's thus well established as both Romeo's best friend and as a personality when we get to the masker's scene. Rojas speaks an enchanting Queen Mab speech, a tall tale he pushes ever taller to deliberately prompt Romeo into finally cutting him off, proclaiming that Mercutio "talk'st of nothing." "True," Roja's Mercutio matter-of-factly replies. "I talk of dreams." Another measure of a Romeo and Juliet production's effectiveness is its ability to induce tears at its conclusion. This production does so not in the double suicide of the lovers but in the heartfelt reconciliation of Don Montague and Don Capulet. It's a lovely moment of hope, but it ravishes us emotionally, nonetheless, as we know that reconciliation could have been accomplished without the deaths of their only son and daughter, respectively. That's a tragedy in any time or place.